As predicted the rain arrived at the Twin Ring Motegi Circuit for a very wet shortened and delayed set of races, with the track only drying during the MotoGP race. Moto3 had the worst of the weather and their short thirteen laps were just as exciting as ever, but unusually, there was no late battle for the win, Nico Antonelli had everything under control form the first corner. Moto2 had spitting rain by the time they set off but still faced a tricky wet surface and despite an early showing from Jonas Folger, once comfortable Zarco displayed why he has become Moto2 champion this weekend, pulling our and maintaining a solid lead. With only thirteen laps to contest after the rain delay Nico Antonelli wasted no time in hitting the front for Ongetta-Rivacold and stayed there until he saw the chequered flag, handing Honda the constructors title. Miguel Oliveira also made up places quickly after his grid demotion ( ‘irresponsible riding’ in FP3 and qualifying along with Masbou, Kornfeil and Navarro) and slotted into second. The Red Bull KTM Ajo man chased down Antonelli but it was not to be, the Portuguese rider second over the line. Many riders had a hold on third over the course of the race, Ono, Loi, Binder and Vinales all had a stint in the final provisional podium slot before crashing out. Isaac Vinales was the last to slip out of the position handing Jorge Navarro (Estrella Galicia 0,0) a rostrum finish for the second race running. Incredibly, the gap to fifth allowed RBA’s Vinales to rejoin for fourth. Zulfahmi Khairuddin took his best finish this year in sixth ahead of the battle of the big title rivals with Leopard’s Danny Kent determined to chase down his Gresini riding rival and doing so after having dropped as low as sixteenth. Kent gains a point on Bastianini but the Italian being so close was enough to prevent Kent’s first title chance becoming a reality. In the same group and riding tough was Karel Hanika on the second Red Bull to finish, swapping paint when required in the mid-field race pack. Just behind was Brit John McPhee who impressed making up places from a 24th place qualifying to finish ninth. Efren Vazquez completed the top ten for Leopard with Jorge Martin the top Mahindra in eleventh and Jakub Kornfeil twelfth for Drive M7 SIC. The remaining points went to home rider Tatsuki Suzuki (CIP) in 13th, Andrea Locatelli (Gresini) 14th and Francesco Bagnaia (Mapfre Team Mahindra) 15th. After their falls Binder and pole sitter Romano Fenati rallied to finish the race. Tonucci, Masbou, Mizuno,Ono, Loi and Gardner all failed to go the distance. With the track still wet but the rain reducing the Moto2 race at Motegi was always going to be tricky. AGR Team rider Jonas Folger made the first move and lead for the first five laps of their shortened fifteen lap race until new Moto2 champion Johann Zarco made his move and pulled out a winning lead for Ajo Motorsport. Folger remained behind the back-flipping Frenchman for a safe second with the podium completed by another German rider- Dynavolt Intact GP’s Sandro Cortese, who picked off his rivals in the closing stages for a hard earned third. Fourth and fifth went to the Malaysian pair of Idemitsu Azlan Shah and Hafizh Syahrin (Petronas Raceline Malaysia) both in the points for the second race in succession, and both looking good in the wet. Shah had a career best and Syahrin a seasons best and Ricky Cardus joined the party in sixth bettering his best ever finish by one place as the weather shook up the race finish. Simone Corsi finished seventh for Forward Racing ahead of Britain’s representative Sam Lowes who moved into eighth on the final lap for speed up after passing Marcel Schrotter, who settled for a best of ninth for Tech3. Randy Krummenacher slotted into the top ten finishers for JiR. Rookie Alex Rins was eleventh for the Pons team and Lorenzo Baldassarri twelfth oon the other Forward entry. The remaining points went to the very experienced wildcards Tomoyoshi Koyama and Yuki Takahashi in 13thand 14th and Mika Kallio who scooped up the final point for QMMF. 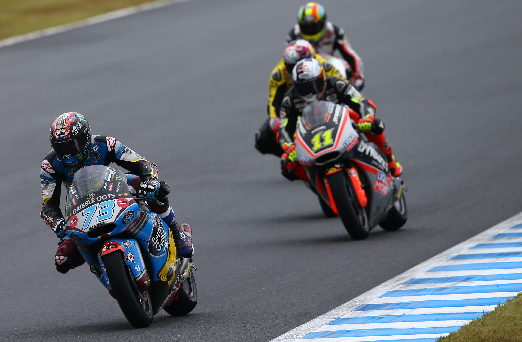 Replacement rider Josh Hook, Axel Pons who was demoted to the back of the grid for an extra warm-up lap, Xavi Vierge, Xavier Simeon, Tom Luthi, Thitipong Warokorn and Luis Salom all failed to finish. Taka Nakagami also fell but rejoined to finish his home race. For the full Moto3 race result, click here. For the full Moto2 race result, click here.